Room for heavyweight problems. 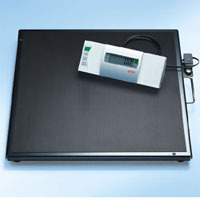 This electronic platform scale is specially desingned for weighing adipose patients. The very high capacity of 300 kg and the 60 x 60 centimetre large platform offer a solid base even for larger people. Thanks to the low level platform of only 45 millimetres, the person can effortlessly step onto the nonslip surface. Another advantage: The cable remote display can be placed at eye level or, for example, on a table. Nothing in the way to obstruct the view of the display. But the internal values of the seca 634 are also matched completely to the patient's use. The graduation of 100 g enables recognition of even the smallest weight change, so that the success of diet programs can be precisely determined at any time- even after leaving the scale. The HOLD function continues to display the weight if necessary. The TARE function and Pre- TARE function enable weighing in the sitting position or under supervision. That the scale is also equipped with the Body- Mass- Index function in addition to conventional weight determination is a matter of course for a seca such as this one.